Kinshasa (Agenzia Fides) - We must have strong institutions, not strong men" says to Agenzia Fides Thierry Nlandu, one of the members of the Comité Laïc de Coordination (CLC), organization of the Catholic laity that led the demonstrations of the population in the last two years to force former President Joseph Kabila to stop running for a third term. The demonstrations promoted by the CLC were repressed in blood, while several opponents were persecuted by security forces. Since late 2017, because of his activism, Professor Nlandu, like others belonging to the CLC, has been forced to hide and live underground. 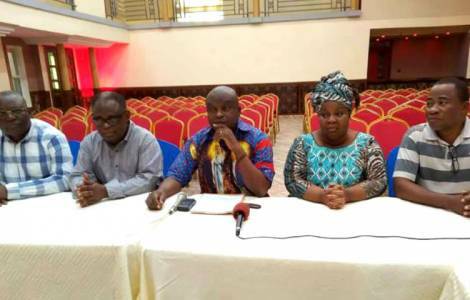 Now after the election of Félix-Antoine Tshisekedi Tshilombo on December 30, 2018, the members of the CLC have regained full freedom of movement. Professor Nlandu tells Fides about his experience. Today there is a new President of the Democratic Republic of Congo and you are finally free. Can we say that you have accomplished your mission? "In the context of Central Africa, where most of the Presidents have changed the Constitution to try to obtain a new mandate, the fact that our Constitution has been respected is a new fact. The Congolese people moved to say no and managed to win. Although their transparency and credibility are questionable, elections were held, and this shows that the people have defeated dictatorship. It is fabulous! And it is also a message for the new President. He must really be the guarantor of the Constitution. The people will not allow him to govern for more than two terms". "First of all, I realize that people have understood that they have to become proactive. Everything that happens to them happens only because you accept it. Now the people have become aware of this. And if they continue in this way, they will manage to impose their demands on the leaders. Everyone's desire is to create strong institutions, not strong men. If we obtain this, we will succeed in establishing democracy in our Country. I have also discovered a laity that emerges and takes the lead. But in the face of a similar laity, which raises the question of good governance, we must expect the same laymen to ask the same questions within the same Church".